Zoom have overhauled the design of the MRS1608 to create a new-look digital recorder. We find out if the changes are more than skin deep. Zoom are renowned for producing feature-packed, musician-friendly gadgets that offer good value, and their latest offering is no exception. The HD16 is a 16-track digital studio that allows the simultaneous recording of eight inputs as 16-bit, 44.1kHz audio files. The converters themselves are 24-bit, as is the internal signal processing, right up until the final stage of the recording process, when it is dithered to the 16-bit standard used on audio CDs. It has an on-board CD/RW drive for making backups and complete song/album masters, plus an integral USB 2.0 bus for archiving song data and exporting and importing WAV files and completed mixes using a Mac or PC. Its internal hard drive is a sizeable 80GB, giving enough space to store up to 160 virtual tracks and 10 master mixes per song. Recorded audio can be altered using a range of editing tools, and several independent effects processors enable further treatment of input audio, record tracks and master mixes. 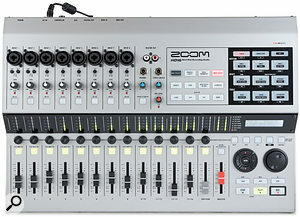 Like previous generations of Zoom multitrack recorders, the HD16 also provides an on-board bass synthesizer, drum machine, loop sample facilities and a harmony-generation processor which, together with step-time and real-time sequencing, can be used for constructing fairly complex rhythm arrangements without the use of any external instruments. At the time the HD16's predecessor, the MRS1608, was reviewed (SOS January 2005, www.soundonsound.com/sos/jan05/articles/zoommrs1608.htm), it was undoubtedly one of the very best mid-priced digital multitrackers on the market, combining the company's popular rhythm machine, effects and sampling technologies with some solid recording, editing and mixing facilities. Back then, it had an RRP of £799, although the USB board was an optional extra at £99.99. Priced at £599, with a very similar core feature set and with USB included as standard, the HD16 effectively offers the same functionality for £300 less! There has, however, also been a pretty dramatic physical redesign, effectively shifting all the I/O, the CD-R/W drive and the drum pads to new locations, and incorporating a huge metering panel right across the middle of the unit. The HD16's array of faders and pots can be used to control Cubase, helping to integrate the machine with the modern studio. 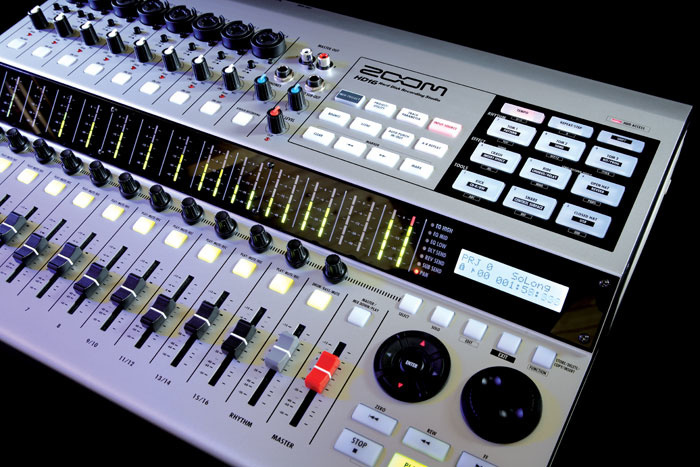 Zoom's publicity for the HD16 states that "its faders, control knobs and level meters are arranged in a clean, professional layout, modelled after expensive mixing consoles found in the best studios." Certainly the meter panel gives that impression, but the layout also reflects the product's ability to function as a MIDI control surface for Steinberg's Cubase LE, which is bundled free, together with suitable controller software templates. When in Control Surface mode, the HD16's faders, buttons, transport controls and rotary encoders offer a means of controlling some of the main Cubase LE parameters and functions. We're told that the HD16 will also control the full version of Cubase, if you own that, and that there's an upgrade path from the bundled LE version of the software. 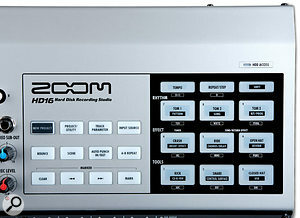 In the past, stand-alone portable 'Recording Studios' primarily existed as an alternative to computer recording systems, but the HD16 is a bit of a hybrid. Unlike many similar products, which tend to record in a proprietary format and require tracks to be converted into WAV files before anything else can read them, the HD16 saves audio in WAV format, so when the Studio is identified to a computer as a USB mass storage device, its tracks are immediately ready to be dragged across into the track channels of Cubase. This being the case, the HD16 could, for example, potentially find favour with musicians as a portable means of capturing song ideas (alongside backing programmed with the rhythm section), who then export the audio into Cubase LE for further refinement back in the comfort of their studio — at which point the HD16 could be pressed into service as a control surface. On previous MRS models, the majority of the I/O was cut into the rear panel, but the new design shifts a lot of it to a more accessible location on the HD16's upper face, leaving the back relatively bare. The connections less likely to be changed regularly have remained at the back, and these include MIDI I/O, an optical-format digital output, the aforementioned USB port, and a quarter-inch jack socket to which a footswitch for triggering punch-in recording or a volume pedal for modulating certain effects can be connected. The only button on the back is the Power On switch, found alongside the input for the external PSU. Everything else can be seen on the machine's upper face, apart from the CD-R/W drive, which is tucked away at the side, just beneath the drum pads. Previous designs placed the drive on the front edge, together with guitar and headphone jacks, but the depth of the HD16 is greater at the back, allowing for the fitting of a very robust-looking drive. At the top left of the HD16, in line with the channel controls, are eight 'Combi' sockets allowing the connection of both XLR and jack leads. Each socket has its own independent 48V phantom power switch, and the first pair also benefit from an 'HZ' button, which adjusts the impedance to suit instruments such as electric guitars. Next in line is a row of preamp adjustment knobs — one for each of the inputs — each accompanied by a red peak LED to indicate when signals are too hot. In addition to its more traditional recording facilities, the HD16 features velocity-sensitive drum pads (right) and on-board bass and drum sounds, making it very convenient for songwriting.Photo: Mike CameronFurther down are the five-segment meters showing a 48dB scale for each channel, and below them is the row of continuous 'Parameter knobs' which are always assigned to the parameter that is selected for editing. If EQ Mid is selected, for example, the knobs will change its gain, Q shape and frequency position as the user toggles through each one. While we're on the subject, the EQ is a three-band parametric design using high and low shelving filters and a mid-band with a Q range of 0.1 to 1.0. All three bands can be shifted up and down in steps: the lower (ranging from 40Hz to 1.6kHz) overlaps the high band (500 to 18kHz), and the mid spans everything from 40Hz up to 18kHz. Cut or boost of 12dB is available to each band, in 1dB steps. Below the Parameter knobs is a corresponding row of channel buttons used for the multiple jobs of muting and selecting tracks, and arming them for recording. Last of all is the row of 14 45mm faders. Like the MRS1608, channels 1-8 enjoy a fader of their own, whereas channels 9-16 are paired up for stereo use, but this time the mono bass and stereo drum tracks are bundled together and require their relative levels to be mixed internally. They do, however enjoy the same mixer channel features as the other channels, and arguably take the track count up to 19. The final fader, entitled Master/Mix Down/Play, controls the global mix level and doubles up as the control for the stereo master track recordings. The audio editing tools, which include Copy, Move, Erase, Trim, Fade In/Out, Reverse, Time Stretch, Pitch Fix, Harmony+ and Duo Harmony, are pretty much the same as those on the 1608. The last two in the list are the most unusual, and offer ways to generate harmonically related versions of a piece of audio by shifting its pitch by an amount determined by the pattern/rhythm programming. The results are then either mixed in with the original or saved to another track. The large illuminating soft pads in the top-right corner of the panel have multiple functions, not only acting as velocity-sensitive drum pads and bass-note keys but also as a means of accessing the sequencer, drum kit and pattern editing pages. In addition, by holding down the pad labelled Shift and pressing some of the other pads, you can access menus relating to the Insert, Chorus/Delay and Reverb effects, as well as more mode-specific ones dedicated to the CD-R/W, Control Surface and USB modes. To the left of the drum pads is another patch of 12 illuminating buttons. The first row tackles song-related functions, such as creating a new project, importing audio, managing track send levels or other parameters, and track routing. The row beneath contains the Scene page, where up to 100 setups can be stored for each song. The usual Auto punch-in facility, A-B repeat and Marker set and locate functions are dealt with by the rest of the buttons. The rhythm section of the HD16 contains 20 drum kits that can be played via the nine large velocity-sensitive soft pads or from a remote controller keyboard. Each kit contains up to 27 sounds, split across three banks. It is possible to have 66 seconds (or 5.5MB) of samples per kit and the maximum sample length per pad is 22 seconds. As far as preferences are concerned, the user is given the opportunity to set each pad's level, pan position and reverb send amount, as well as to determine whether or not its sound is cut off by the triggering of other pads assigned to its group. The pads can be switched to act as bass keys by pressing the channel button above the Rhythm fader. The 11 bass sounds, named Pick, Subtone, Hummer, Juno, Techno, Moog, Slap, Muted, Fretless, Acoustic and Finger, provide a good starting point for most tracks, although, in a lot of cases, it might be desirable to replace them with a recording of a real player in the future. Playing them from a MIDI keyboard is probably the best option but, with a little careful programming, the pads are useful enough for basic riffs. Using the Pick sound with a minor scale setting, for example, it is quite easy to play a passable version of Fleetwood Mac's 'The Chain' five-note bass riff! Those who don't want to use the HD16 to create their rhythm tracks can still use one of the 470 or more preset drum pattern as a sophisticated metronome or as a rough backing track, and the Tempo button offers a quick way to alter the tempo with a few taps of the finger. Those that do want to take things further can create their own patterns and organise them into song structures alongside recorded material, either by playing the notes or beats in real time or programming them in using the step-time mode. During the review, I encountered a couple of minor anomalies which could have been caused by software bugs. One resulted in the triggering of unwanted bass notes. These couldn't be removed in the prescribed manner using the step-time editing procedure, only in the real-time mode. Otherwise everything worked as it should, although programming entire sequences does feel like hard work, because there's a lot of toggling through parameters to view them on the small screen. The on-board effects are arranged so that there is always a stereo reverb and a chorus/delay available for use in a send/return configuration. There is also a separate auxiliary send path from each channel, which is output from the Stereo Sub-out jack next to that of the headphones, and can be used as either a send to an external effects processor or secondary headphone feed. Separate from the send effects are the Insert algorithms, which include dynamic processors such as compressors and amp and speaker simulators, and cater for guitar, drums and vocal recordings. The user can choose whether to make the insert position at the start of the signal chain so that it is recorded; after the recorder during mixing; or in the stereo path to the master outputs, but the insert point can't be in two places at once. 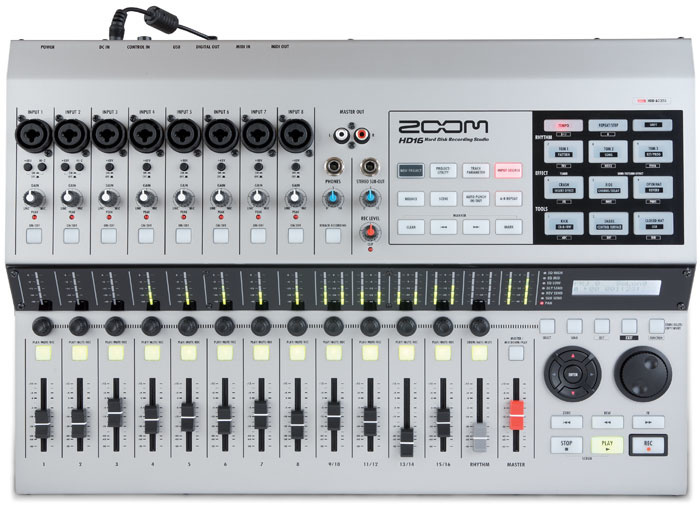 For ease of use, Zoom have created a range of effect-algorithm setups to suit certain recording situations. Selecting Line, for example, calls up a program containing a stereo arrangement tailored for processing keyboards and sound modules. A particularly interesting one is 8xComp EQ, which provides a set of eight independent processors designed for simultaneous use on a drum-kit recording. Most algorithms contain a three-band EQ, a preamp, a compressor-limiter, a delay and/or a modulation effect, but these can be switched on or off as required, and there is a useful number of editable parameters in each case. The only thing it isn't possible to do is change the order of the effect blocks. 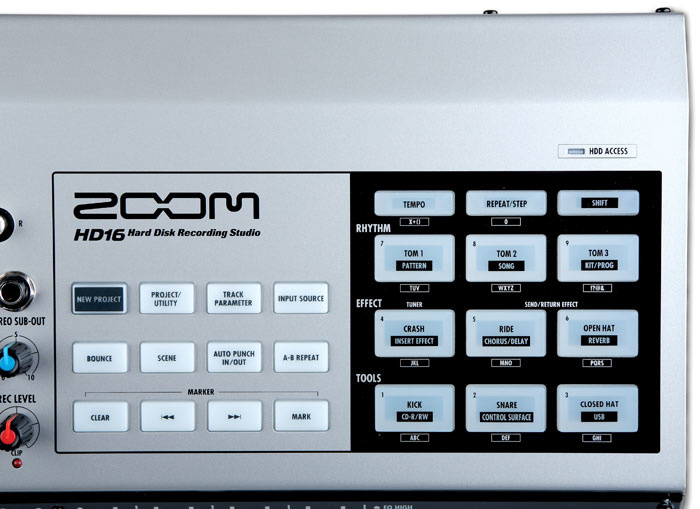 At the moment, the main competition the HD16 faces is from the Tascam 2488MkII which has a track count of 24, even in 24-bit recording mode, and sells for not too much more money. The Tascam certainly doesn't offer anything like the rhythm tools of the HD16, but it is very user-friendly and has some rather good monitoring and navigation facilities. Yamaha's AW1600 is pretty much unrivalled in the mixer department, having dynamics on every channel and impressive signal-routing options, and it even has a pad sampler and MIDI controller mode to compete with Zoom's HD16. Nevertheless, it doesn't share the HD16's rhythm facilities. The BR1600CD is the only thing Roland currently present as competition, but it sacrifices tracks for its drum machine and bass synth, and costs more. Fostex have recently announced an MR16HD/CD that has 16 tracks and majors on usability and guitar processing, but it is only capable of four-track simultaneous recording and lacks Zoom's rhythm features. Operationally, the HD16 seems very solid. Although it's a little ponderous when starting up, shutdown is almost instantaneous. Moving in and out of non-recording modes, such as the USB and Control Surface modes, is swift, although it is necessary to Exit before getting on with more general work. The screen, integrated into the meter panel, is very small, but Zoom have worked extremely hard to reduce its importance, providing a well-designed set of illuminating cursor keys for menu navigation, and a row of seven LEDs to the left of the screen indicating which effect processor, pan setting or EQ parameter is selected for editing. In particular, the four cursors (left, right, up and down, with an Enter button in the middle) are really good for getting you around and providing information as to whether or not there are other menu options or editable parameters available. Simply put, if an arrow light is on, it is showing that there are more menu options or editable parameters to be found in that direction. Despite these good points, learning how to operate the HD16 is not as easy as it could be, primarily because there is a lack of consistency in the way that the programmers have split operations between the panels of soft keys and allocated tasks to the various Function, Exit, Edit, Enter and Cursor keys. I found it difficult to recall exactly what button combinations were needed to get me back to certain menus and had to repeatedly refer to the manual to refresh my memory. My experience of more intuitive systems is that it quickly becomes possible to second-guess where a particular menu or parameter can be accessed and how to edit it, and it is therefore less necessary to rely on the manual for help. Inevitably, programming the drums and patterns takes some getting used to. Having to duck in and out of menus to audition kits, switch banks, create patterns and edit sequences is not very conducive to the creative flow. It is possible to build complex patterns and song structures, but it is all made hard work by the sheer number of screens that the user has to flick through, and, once again, it is hard to remember the various button combinations. Admittedly, it probably isn't as arduous as programming my Roland MC50 sequencer, which now seems like second nature to me, but such familiarity comes from years of use. On the plus side, recording quality is pretty good and machine noise is very low. The effects, particularly the reverbs and guitar amp simulators, are very effective and will be more than sufficient for most demo projects. The only issue is that a mastering processor cannot be used on the stereo mix if insert effects are being applied to individual tracks, so it is necessary to bounce mixes down beforehand. The EQ also does its job well, exhibiting no zipper noise, as is occasionally the case on budget products. It is actually quite flexible compared to many three-band designs, which tend to have fixed-position shelving bands, but not being able to view all the settings associated with a channel in one screen is frustrating. Things would be different if there were physical controls, as they would show at a glance the status of each EQ parameter, but here it is a case of toggling through gain, frequency and Q pages of each band to find out. To use the HD16 as a control surface for Cubase LE it is first necessary to copy a control surface file from the supplied Factory Recover CD to the computer's hard drive. From within the Devices Setup page this can be loaded as a generic controller template, and then just about all the controls have a use. The one thing really missing from the HD16 is an undo function, as this makes digital editing a risky affair. Zoom have implemented a track capture feature but it is no replacement for having a proper record event history. At the same time as the HD16, Zoom have launched the HD8, priced at £449. The manual actually refers to both machines side by side, as the features they have are identical in type, even though the HD8 has fewer channels, tracks and inputs. As its name suggests, there are eight playback tracks, plus 80 virtual ones. The HD8 has just two Combi-jack sockets, so its simultaneous recording capability is reduced accordingly. As with previous Zoom multitrackers, the HD16 is packed with song-creation tools that work alongside a standard complement of recording and mixing functions. The on-board bass synth, drum machine and loop sampler can all be pressed into action, using some comprehensive song-arrangement and pattern-sequencing facilities, to form the basis of a composition. Then there is the possibility of using the HD16 as a MIDI control surface, or even as an SMF player. Its strength is undoubtedly its versatility, and in those terms it is impressive, especially at its sub-£600 UK retail price. The sizeable on board collection of drum and percussion samples, most of which are very playable, will provide enough options for many users but, of course, with the possibility of being able to load others from CD, via USB, or even by sampling from an audio track, the standard set is only a starting point. As a mixer, it offers all the basics, although it is more 'ordinary' in that department. The new case modelling, designed to reflect that of professional consoles, is certainly not carried through into the feature set, as the short 45mm faders are not motorised, and there is no onboard automation, channel dynamics, waveform display or professional I/O, nor their related routing options. What's more, given that there is 80 gigabytes of disk space available, Zoom really should include at least some levels of undo, particularly as it would encourage experimentation using on-board editing options such as Reverse. It also has to be said that, although the cursor keys and various function buttons cleverly interact, there is some confusion in the design. A larger screen capable of displaying, say, all the EQ parameters of a particular channel on just one page, would improve usability immensely and may have enabled the OS writer to improve the workflow. The bottom line, though, is that there is no reason why, with a little care, someone couldn't produce high-quality recordings and compositions using this machine, and in conjunction with Cubase, it offers much more besides. Radical new look re-examines the digital mutitracker concept. Can be used as a control surface for the bundled Cubase LE. On-board sequencer, drum machine, sampler, bass synth and harmony tools. Small screen means that visual feedback of settings is very restricted. Could do with a couple more output options. Pattern sequencer could be easier to use. Can't use effects in mixer channels and for mastering at the same time. Zoom have redefined their Recording Studio concept with the HD16, providing it with a new and improved ergonomic design and even enabling it to function as a MIDI control surface for Cubase. With so many on-board sound creation tools at such a low retail price, this product is a great buy for anyone without much outboard. Exclusive Distribution +44 (0)1462 481148.